Dr. Oetker Ristorante is running a “Tales of the Heart” contest to reward romantic couples with an all-expense paid trip to Italy. All you have to do is upload a picture of you and our significant other chowing down on some Dr. Oetker pizza and briefly explain your love story HERE... www.ristorante.us. 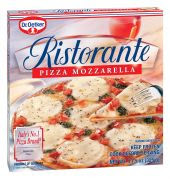 A coupon for a FREE Dr. Oetker Pizza ! WINNER is Donna C., winners has been emailed! I will be using a random number generator to select the winner. Contest ends at 11:59pm CST on 02/11/10. If the prize is not claimed in 48 hours a new winner will be chosen. Contest open to U.S. residents only.The winner will be announced in this post(and emailed).